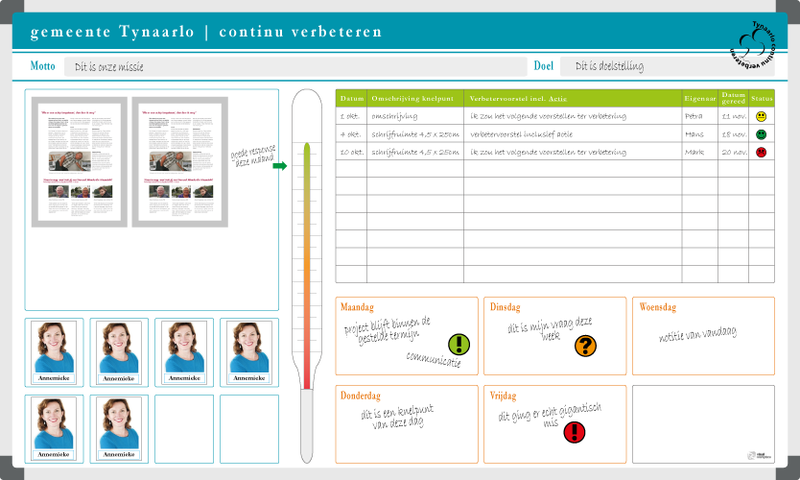 This part of the webshop is specially designed to give you more information regarding visual management. What are the principles and how do you implement it within your organisation? You can find information from a lean point of view but also sector-related information. 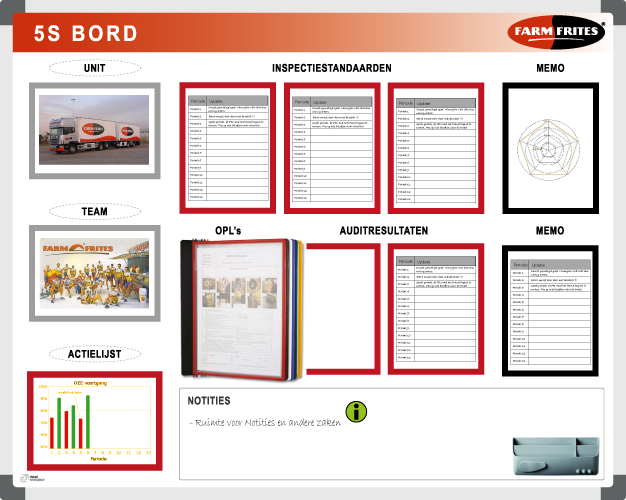 How does your sector implement visual management with whiteboards and magnetic tools? 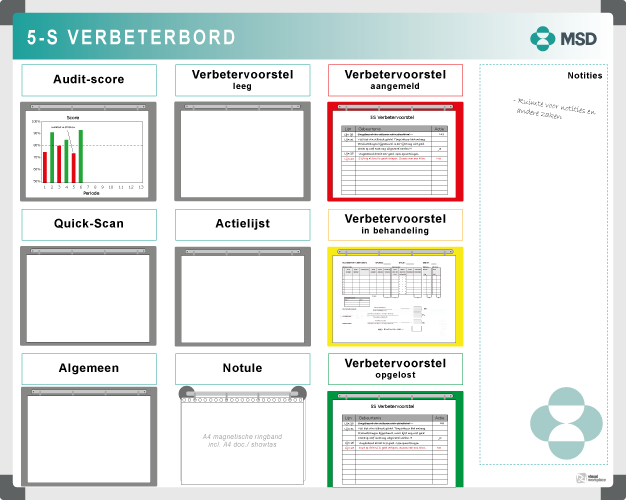 You can also read how our customers have used visual management boards and about the role TnP played in the process. "Get that tape off the wall!" 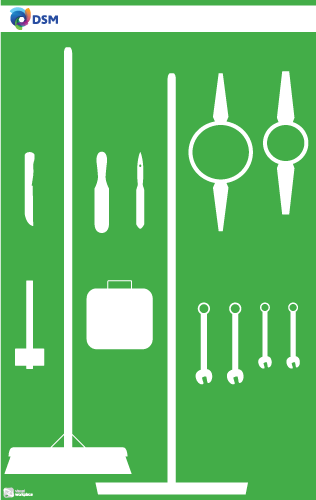 Are lean tools and improvement boards always employable? A team makes bottlenecks and opportunities for improvement visible on the improvement board. Identifying problems is important in work; when everyone knows what is going on, everyone can think about a solution. We started with the improvement board, where everyone can contribute points for improvement that are worthy of consideration, including causes and possible solutions. The board ensures that it is clear to everyone what is going on. This is the most standard version of an improvement board to use in cyclic actions. Since we started the Lean journey at DSM Coating Resins in Waalwijk in 2012, 5S is a well-known concept. A good example of the 5S strategy is TnP’s shadow boards. TnP delivered the boards quickly, as agreed, tailor-made and in colour with the company logo. The boards create a kind of individual identity that increases the backing from the people who use them daily. 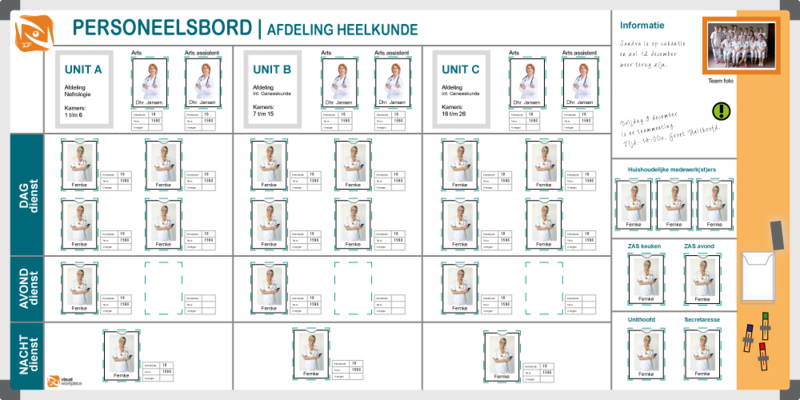 You can make a shadow board extra effective by arranging it in a department-specific way. 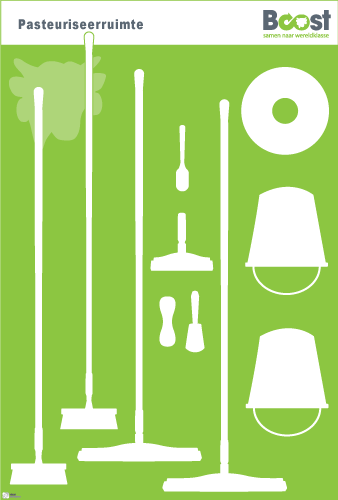 Including department name, optional improvement slogan (recognisable and motivating), in own corporate identity and with a key so that is always clear to everyone where the cleaning materials can be used. The shadow boards that are used at BEL Leerdammer contain the BOOST logo. An improvement project in BEL. Recognisable to employees, which creates commitment and motivation. The boards encourage people to keep the materials in the right place. The challenge is to inspire people in such a way that they wish to maintain the system. The boards support this; they provide communication. People have to respond to what is written on these boards, whether it is good news or bad news. This 5S improvement board is designed to hang in a production line. By working with magnetic clipboards, the improvement proposal can easily be directly described on the board. The suggested improvements are entered onto A4 documents. We decided to record progress on a big board, instead of in folders. We hung the board in the hallway, where everybody can see it, including the numerous temporary employees. The result is that people are keen to improve the results recorded on the board. 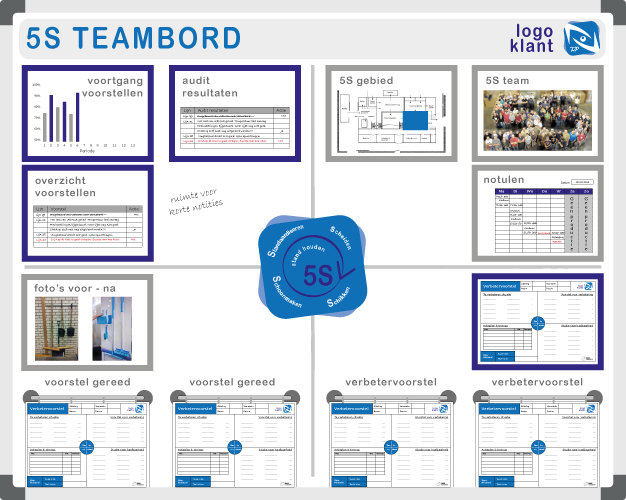 This small 5S board supports the 5S progress on a construction site in a simple way. What are the arrangements, what are the successes (‘before’ and ‘after’ photos) and which schedule do we use for the coming period. 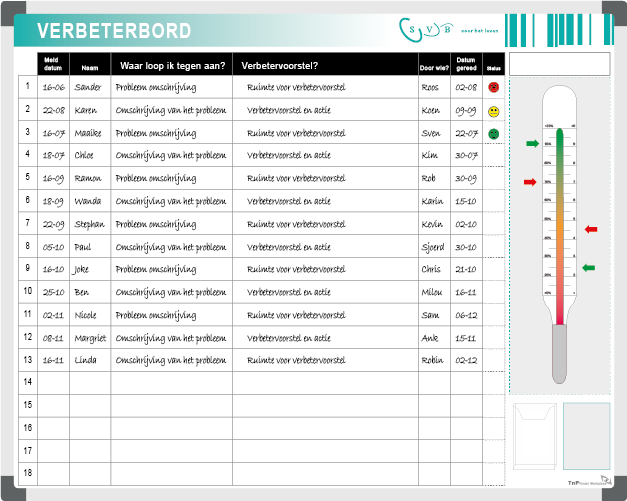 Employees can therefore note their improvement proposals in an accessible way. 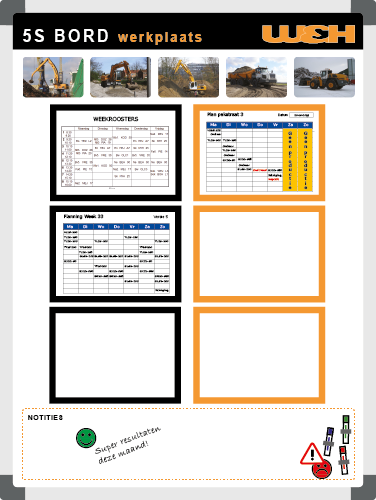 This 5S information board is comprehensive and includes appointments, schedules, measurements and notes regarding 5S workplace organisation of a particular department. By using various materials, the Visualisation Board is highly suitable for supporting and empowering 5S on the work floor. An OEE board is always a customised Visualisation board. It supports OEE within an organisation. 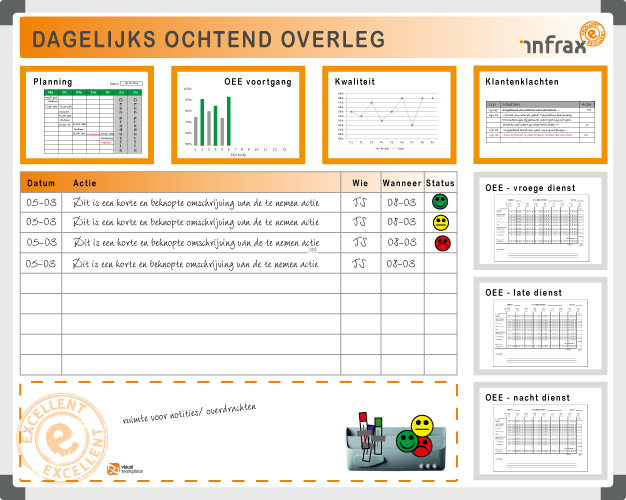 OEE is an efficiency indicator for manufacturing equipment and processes. 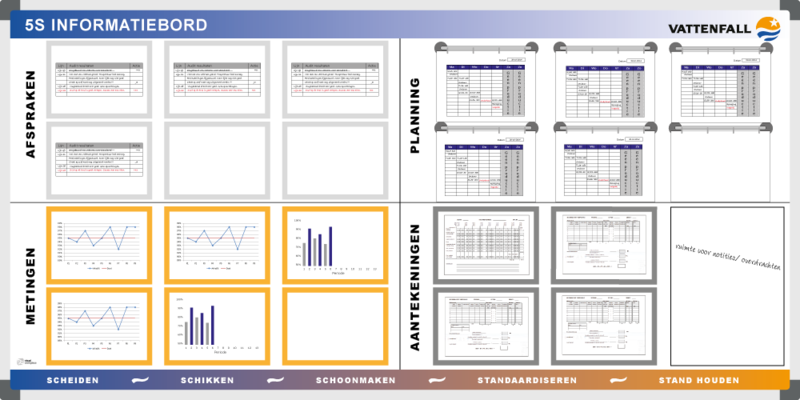 Visual management is an important tool in the management of production processes and a common application is the OEE board. Setting goals is important for any organisation. Bigger organisations translate top-level business objectives to the underlying departmental objectives. 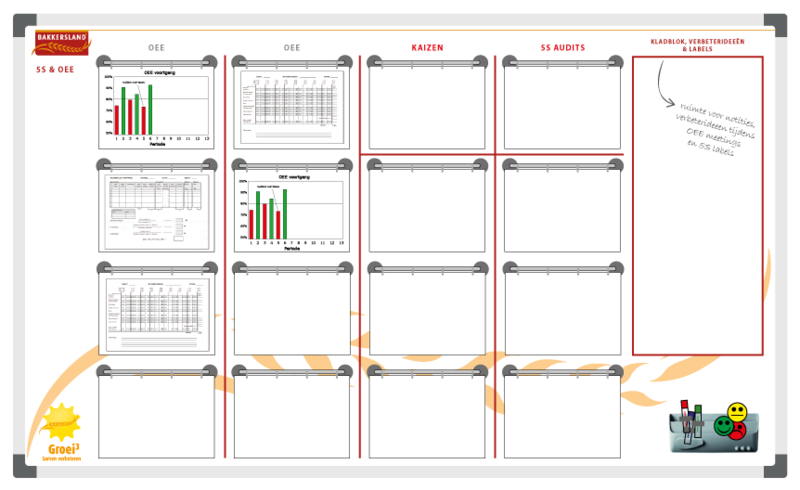 For good control of the objectives in the workplace, the use of a target board (policy board or KPI board) is indispensable. 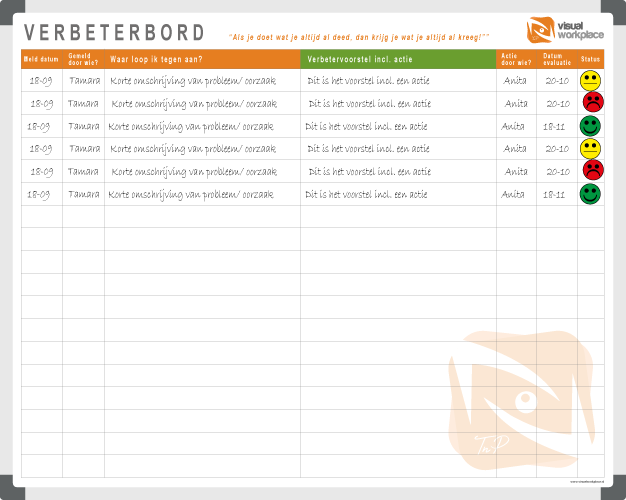 Make a schedule eye-catching on the work floor to create direct guidance and an optimal overview. The planning board hangs centrally within an environment, it gives a clear overview, it will encourage interactions and make suggestions for improvement into actions and is easy to use. Do not make it too complex. 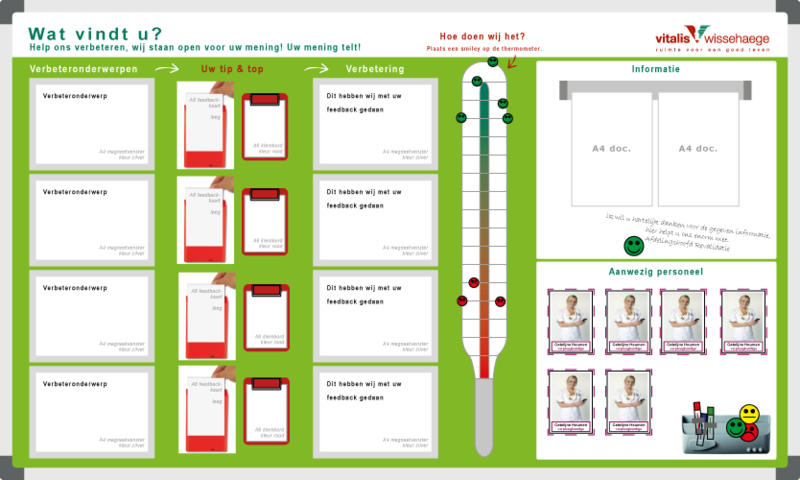 On these boards, one can find information about the quality of care displayed in an understandable and visual manner. This information can differ per department; it can for instance concern patient satisfaction, bedsores, malnutrition or availability by phone of the outpatient clinic. If you use visual management, one of the pillars is also making people and organisations into visual elements. Who is responsible for which subject? Who is at work at which part of the day? Attendance boards, personnel boards, staff schedule and simple but custom "face-boards" support this. Transparent and clear in staffing, in respect of management, staff and visitors. 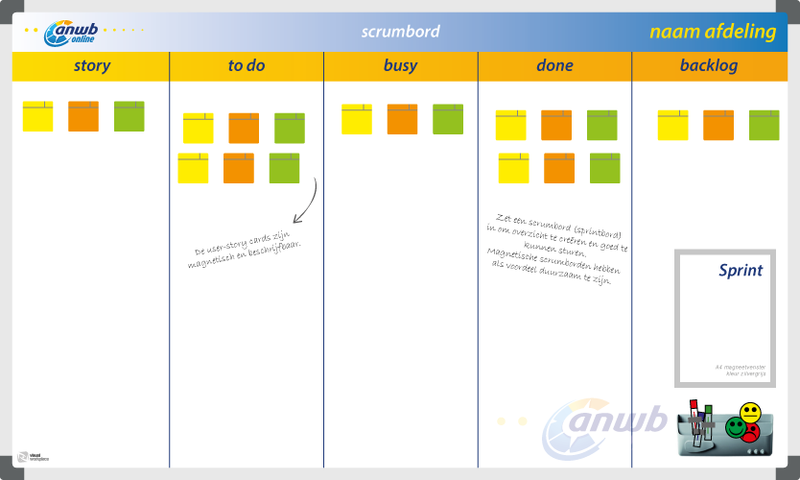 Use a scrum board (sprint board) to create overview and full control. 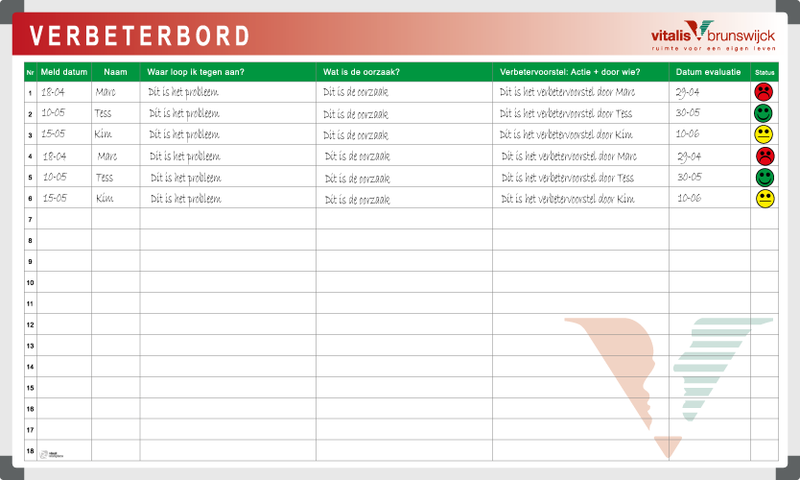 Magnetic scrum boards have the advantage of being durable. The user story cards are magnetic and writable. They remain firmly in place, they are easy to use and look professional. Operational Excellence (OPEX) focuses on reducing operational costs. 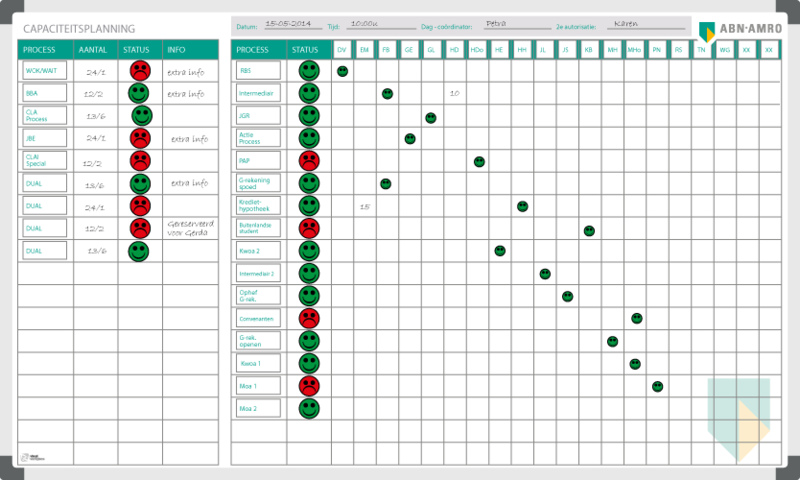 Visualisation of the operational results using an OPEX board is an important element. 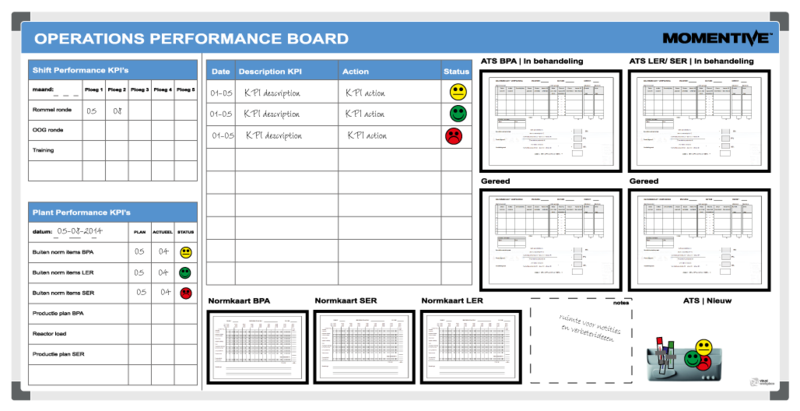 An example of an OPEX board is a Daily Performance Review (DPR) board. During this DPR, events of the past 24hrs are discussed in terms of scheduling, quality and production volumes.